Apartments were nice and spacious. Staff was very helpful and forthcoming. Easy to access with a car, two supermarkets, two restaurants and a very nice beach within the walking distance. The apartment itself was beautiful and the swimming pools were good. Lovely studio apartment within new complex. Large clean pool behind our apartment block and another beside the onsite restaurant and bar. Helpful staff, clean and 15 minute walk to the beach, if you are staying in the new complex down the road it is not right on the beach as described. Nearly everything especially the staff. The lady who dealt with us was excellent. The apartment was in a quiet area, family friendly, a lot of playgrounds, swimming pool was amazing. Great location for exploring Cyprus. The pool and other facilities were clean and well maintained. The choice of three pools meant that we always had a sun bed. The local restaurants were very friendly and happy to accommodate our daughters need for gluten free food. Very clean and new apartment. The kitchen got everything we need for cooking. The most comfortable bed ever. The view, which is really beautiful. The apartment and furniture, which are new. Located in Trikomo, Long Beach Rental Apartments offers accommodations with a balcony. There's a water park on site and guests can enjoy the on-site bar. All units come with a living room, a seating area with a sofa, a flat-screen TV, a fully equipped kitchen with a dining table and a private bathroom. Some units include a terrace and/or a patio with sea views. Guests can grab a bite to eat in the in-house restaurant, which serves a variety of Pizza, British and Mexican dishes. Ayia Napa is 30 miles from Long Beach Rental Apartments, while Protaras is 31 miles away. The nearest airport is Ercan International Airport, 31 miles from the property. When would you like to stay at Long Beach Rental Apartments? This apartment has a patio, tile/marble floor and washing machine. You are only 1 minute away from one of the best beaches of Cyprus, pearl of the Mediterranean. You can make the most of warm sun at the sandy beach overlooking the bright blue sea in 1.5 km long Long Beach and you and your family can enjoy your day in the pools right next to your apartment while you are living every comfort of a 5 star hotel. You can go out to experience the natural and historical beauties of Cyprus during the day, and enjoy the colourful night life until the first lights of the day. We will be welcoming you in our resort that you will be sharing with our elite guests from all around the world. 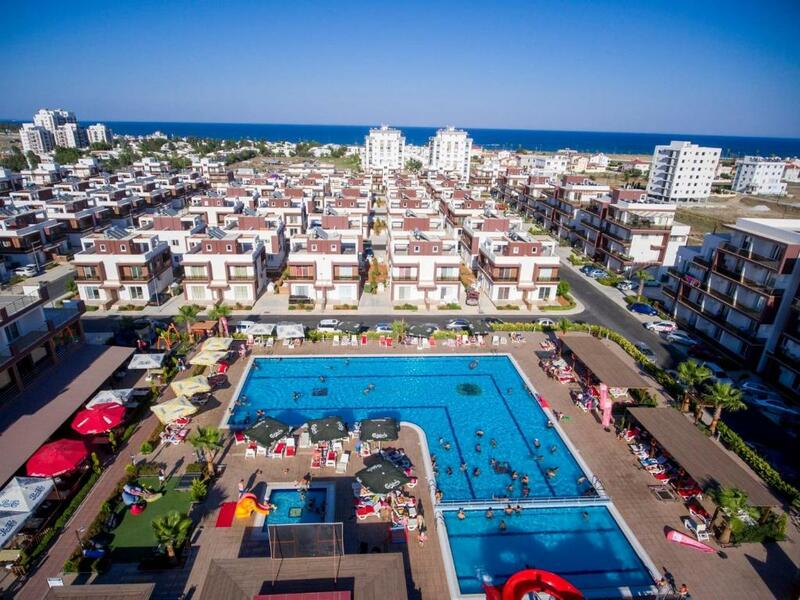 Long Beach Tatil Evleri consists of three different complexes neighbouring each other. Guests staying in one complex can also use the pools and social facilities in other complexes. Everything you're looking for in a holiday is right here for you. An apartment opening out on to the swimming pool, sandy beach only 1 mn walk away, bright clean blue sea, cycling and walking tracks, sports facilities, kids playgrounds, all waiting for you. Market and restaurant is also right next to your apartment. WiFi is available in the hotel rooms and costs EUR 1.20 per 24 hours. House Rules Long Beach Rental Apartments takes special requests – add in the next step! Long Beach Rental Apartments accepts these cards and reserves the right to temporarily hold an amount prior to arrival. THE PLACE ITSELF COULD NOT BE FAULTED. The apartment had not been made comfortable for guests to use; there was no bath math down so my children slipped on the floor after showering. No wine glasses, bare light bulb, no bedside tables or lamps, no kettle or anything to make life comfortable. It seems the owner has put the bare minimum in the apartment, to get by. The credit card machine was apparently broken so the hosts wanted to immediately drive us to a bank to get cash out. The host could have contacted us to let us know beforehand, and we could have brought cash. Poor service in my opinion. The advert stated there was a free waterpark onsite; this turned out to be one slide. My children were upset when we arrived. If we had known this, we would have booked elsewhere. The spa was closed for the duration of our stay, again, no one informed us of this. Again, disappointed as this was another reason for booking. I thought overall the resort was ok, but the apartment was certainly not value for money. Will not be returning and would not recommend to friends. The mattress was like concrete and the pillows too soft, only 2 were provided also. Had we have wanted to cook anything the oven hadn’t yet been connected, the polystyrene was still inside the lift which is a fire hazard! Im not sure we should have been staying in the block we were in it wasn’t finished! Building works were going on all around our block and from 7am that was all you could hear, there was no mention when I booked that this was happening. There is a main property nearer the beach which is where the reception is located. We were then informed our apartment was in another area which we would have to drive to. We arrived at our studio apartment which was very basic and smelt of drains and the sofa bed had not been made. The employee advised us the smell was because it had not been stayed in for a while however, the smell was clearly drains. Luckily our family were staying in another apartment. We complained to reception as the smell was unbearable and were allowed to stay in the apartment with the rest of our family. We were refunded for the stay however, I was told to come back in the morning for the refund. When I went to the reception in the morning I was told that they could only refund the cost of the room and deposit via cash. When I questioned this I was told it is their policy and if I had gone back the day before they could have cancelled the card payment! There is not a lot around in walking distance of the complex. Plugs on kettle and other appliances were only 2 pin not 3, and no adapter provided, thankfully we had an electrician in our party who sorted a fix. Very clean. Staff friendly and efficient. Terrible directions to find the property. We had to ask at 3 different locations before finding the reception. Some items described were not present including toaster, oven, utensils. We booked 1 bed apartment for 2 adults and 2 children. We did not get any extra blanket and pillows for the children. Staff were very slow. It took over an hour to check in one family before us and at one point we had to stand out in 30 degre heat as the reception was locked while the staff showed someone to their room. The apartment had very basic cooking equipment, one small frying pan and a huge pot, made it hard to cook a proper meal and contrary to the information given there was no stove/oven, just a gas hob and a microwave. We followed the location and it led us to the middle of nowhere. The actual location is at Sealife Residence. Staff didn't communicate well so it was very complicated to check in plus no internet access on the north side. Thus, no wifi for the 2-night stay, which is quite inconvenient. Complicated to check in. We had to go through several places. They do not offer internet and if you want to buy it for a weekend for example, it is not possible because they only offer a package of at least a week. And it's still complicated, you go in one place to ask, another has to authorize. anyway, nothing practical. We made the reservation for two adults and two children. They didn't have towels and bedding for everyone, only for two people. We asked at the front desk and they told us that they "would try to get it" ... they did not even give us an answer. An absurdity. My husband and I sleep without a blanket, to cover our children. And we had to share a bath towel so our children could share the other. In short, there were many negative points that outweighed the positives. Wi-Fi not included in the price, no option to have it only for a few days (week minimum). Maintenance could be improved (couple of things that could be repaired here and there). The apartment is beautiful, very modern with reasonable fittings, BUT it was nothing like the apartment we booked and paid for, according to our booking confirmation it should have had TV well ok it did but it did not work, at the office they said I needed a modem which they could supply for a 40 euro deposit and a further 30 Turkish Lira or Internet access for 7 days (the minimum despite the fact we were only staying 3 days), I paid this but after visiting the apartment the engineer said it would not be available till the next morning, we waited till 10am the next day but nobody came so we went out, when we got back we went to the office but were told that all the technicians had gone home and that it would be the next morning, as we only had 1 more day they refunded our deposit and our internet payment and gave us a password for the office internet but to use that I had to park outside the office and sit in my car. The confirmation said we would have a dishwasher and microwave oven but we didn't get theses. The confirmation said we would Sea View, we could glimpse a little bit of the sea about half a mile away through the gap in some buildings. The confirmation said we would have a Pool with a view, there was NO pool and no view of one. 2 minutes from the beach is actually a 15 minute walk through the complex. The apartment doesn't really exist in name, at no point did we see anything that had the name on it, after going up and down the road over and over again and stopping to ask at various shops we were directed to a supermarket bearing the name Doktolar, but they didn't know where we should be even though the shop owner was ultra helpful and remembered me from a previous visit to the area 2. The apartment is situated in a big complex with a very nice pool. Unfortunately, on the days we were there, there were parties at the pool that went on until 1 - 2 am. The music was super loud, even though the building rules state clearly that there shouldn't be any noise after 10 pm. We were there during a religious holiday, so maybe the music was on just on those specific days - if you are planning to stay here you should definitely ask in advance. The apartment was very modern, very nice, super clean, there was everything we needed, even an 18l bottle of water and washing powder. There were two balconies and a super comfortable bed. It is a great location if you want to explore the wider area and there are good beaches nearby (not too close to the apartment though).